278 pages | 11 B/W Illus. 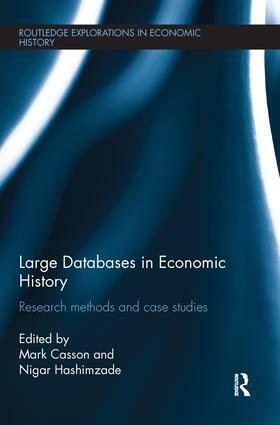 ‘Big data’ is now readily available to economic historians, thanks to the digitisation of primary sources, collaborative research linking different data sets, and the publication of databases on the internet. Key economic indicators, such as the consumer price index, can be tracked over long periods, and qualitative information, such as land use, can be converted to a quantitative form. In order to fully exploit these innovations it is necessary to use sophisticated statistical techniques to reveal the patterns hidden in datasets, and this book shows how this can be done. A distinguished group of economic historians have teamed up with younger researchers to pilot the application of new techniques to ‘big data’. Topics addressed in this volume include prices and the standard of living, money supply, credit markets, land values and land use, transport, technological innovation, and business networks. The research spans the medieval, early modern and modern periods. Research methods include simultaneous equation systems, stochastic trends and discrete choice modelling. This book is essential reading for doctoral and post-doctoral researchers in business, economic and social history. The case studies will also appeal to historical geographers and applied econometricians. 'This book makes applied econometric methods accessible to anyone interested in quantitative economic history' — Helen Paul, University of Southampton, UK. Mark Casson is Professor of Economics at the University of Reading, UK. His research focuses on economic history, business history and econometrics. Nigar Hashimzade is Professor of Economics at the University of Durham, UK. Her research focuses on time series econometrics and public economics.